Courts of Clarksburg is a new active adult community in Clarksburg, Maryland. 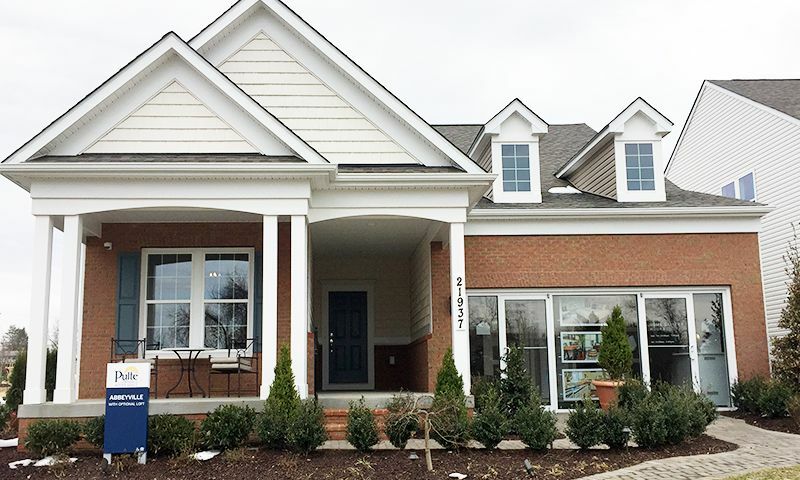 Built by highly respected builder Pulte Homes, this 55+ community is located in the prestigious Clarksburg Village master-planned community. Residents of the age-restricted neighborhood will enjoy exclusive access to a private clubhouse in addition to the shared amenities in Clarksburg Village. Located on the edge of the Washington D.C. area, Courts of Clarksburg combines easy access to the metro area while being far away enough to avoid the bustle of the city. Courts of Clarksburg will feature its own private clubhouse, separate from the Clarksburg Village amenities, and will be the hub of community events, fitness activities, and gatherings. An exercise room will give residents the opportunity to maintain an active and healthy lifestyle. A multi-purpose room and catering kitchen provide open areas for community events, social functions, and celebrations. A crafts room will provide active adults space to practice their favorite arts and crafts in a social setting as well as the chance to learn new skills. A community garden just outside of the clubhouse will give residents with a green thumb additional room for vegetable and ornamental plantings. Residents of Courts of Clarksburg will also have access to the resort-style amenities of Clarksburg Village. Amenities include meeting spaces and kitchens for social events and entertaining. Each of the two clubhouses feature two olympic-style lap pools that host active swimming clubs. Softball, baseball, soccer, and a cricket field dot this master planned-community and are connected by a six-and-a-half mile walking and biking trail. Outdoor amenities are very important in this community with a minimum of 25% of the 788 acres set aside to serve as maintained natural green spaces and wooded areas. Pulte Homes began construction of the planned 140 single-family homes in 2016. These new homes are single-level with optional second floors. Three floorplans with plenty of customizable options are available, ranging in size from 1,676 to 1,877 square feet with two to five bedrooms, two to four bathrooms, and an attached two-car garages. Floorplans are open designs with a spacious kitchen and gathering room allowing for abundant natural light. Many homes feature dens that can be utilized as a private space, entertaining areas, or guest bedroom. The homeowner's association will cover maintenance of the clubhouses and outdoor spaces and well as coordinate snow and garbage removal. Courts of Clarksburg is part of Clarksburg Village, a large master-planned community spanning 788 acres. Much of the activity in this active adult community will be centered around the clubhouse where residents will be able to form interest clubs and hobby groups. Active adults will appreciate the outdoor-focused amenities and the opportunities they present for activity and recreation. Miles of walking and running trails encourage residents to enjoy as the beautiful outdoors. Clarksburg Village is a very socially active community with annual holiday family-friendly gatherings, seasonal fun runs, and other social gatherings. A retail center in the community has several restaurants that are also popular destinations for socializing and catching up with neighbors. There are numerous active clubs in the community with activities like Yoga classes, movie nights, arts & crafts gatherings, and baseball. Located on the edges of the Baltimore-D.C.-metro area in Clarksburg, Maryland residents of the Courts of Clarksburg enjoy easy access to many of the region's attractions while enjoying a calm and tranquil environment. Clarksburg Village Center shopping center is just about two miles away offers restaurants, grocery stores, banking, and other conveniences. Additional grocery shopping, a hardware store, and other retailers are less than ten minutes to the southwest. Courts of Clarksburg is located just five miles away from Holy Cross Germantown Hospital near Interstate 270. This major arterial highway provides easy access to the Baltimore-D.C. metropolitan area to the south. For long distance travel, the Ronald Reagan National Airport is just under 40 miles away. The city of Washington D.C. is steeped in history and offers some of the finest artistic and cultural attractions in the country. Baltimore is about an hour away and offers attractions like historic harbor, shopping, restaurants and the National Aquarium. Courts of Clarksburg is a great 55+ community with so much to offer active adult homeowners in Clarksburg, Maryland. There are plenty of activities available in Courts of Clarksburg. Here is a sample of some of the clubs, activities and classes offered here. The Dogwood Collection offers 1,676 to 1,877 square-foot homes with two to five bedrooms, two to four bathrooms, and an attached two car garage. Floorplans are open designs with a spacious kitchen and gathering room allowing for lots of natural light. Many homes feature dens that can be utilized as private space, entertaining space, or guest bedroom. Please Note: Floor plans are not available at this time. 55places.com is not affiliated with the developer(s) or homeowners association of Courts of Clarksburg. The information you submit is distributed to a 55places.com Partner Agent, who is a licensed real estate agent. The information regarding Courts of Clarksburg has not been verified or approved by the developer or homeowners association. Please verify all information prior to purchasing. 55places.com is not responsible for any errors regarding the information displayed on this website.